May buy 1 for yourself and 1 additional as a gift. May use 1 per person. Must redeem entire voucher value 1 visit. No refund on unused tokens purchased through this deal. Expires 4 months after purchase. See the terms that apply to all deals. Game Grid Arcade features over 55 games including rarities like Warlords, Chase HQ2, and The Act: An Interactive Comedy. 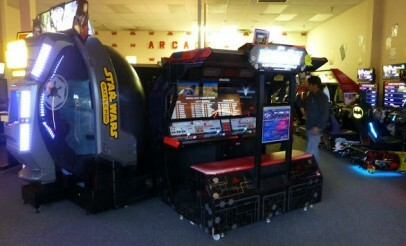 You'll also find modern and old-school classics like Space Invaders, Pac-Man, and The Walking Dead. Game Grid Arcade carries on the great American tradition of arcade games by offering a unique mix of arcade entertainment in its purest form. They have several games that are NOT available on a home console or even in emulation! Besides, nothing beats the original. Come play in a safe fun environment and show off your skills.